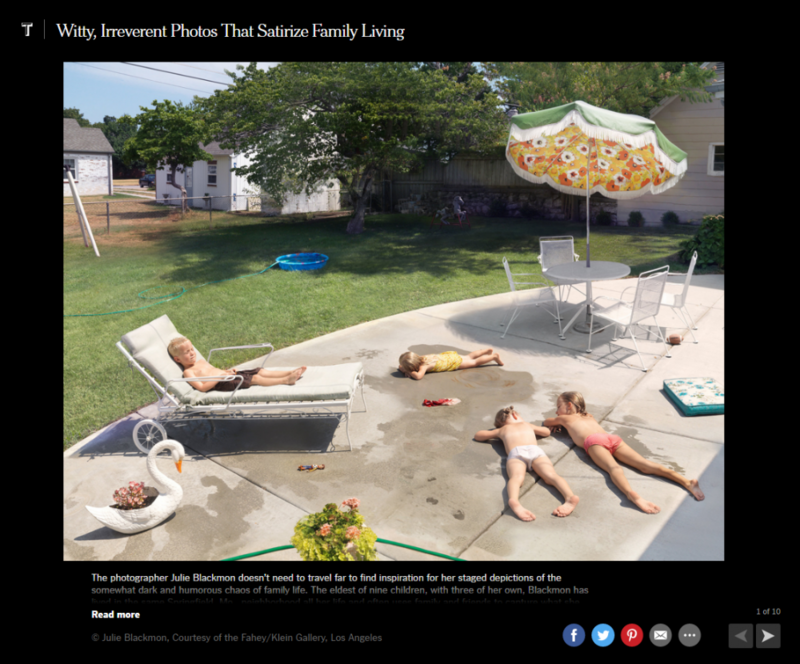 The photographer Julie Blackmon doesn’t need to travel far to find inspiration for her staged depictions of the somewhat dark and humorous chaos of family life. The eldest of nine children, with three of her own, Blackmon has lived in the same Springfield, Mo., neighborhood all her life and often uses family and friends to capture what she calls a “fantastical look at everyday life.” At first glance, the images seem idyllic, like modern-day Norman Rockwell paintings. Yet underneath, there is something slightly askew — details just a little bit off that both highlight and satirize the conflicting expectations of parenting. A show of Blackmon’s work, “Down Time,” is on view through Sept. 3 at the Fahey/Klein Gallery, 148 North La Brea Avenue, Los Angeles, faheykleingallery.com.